TWENTY-YEAR-OLD Musa Abdulahi and 30-year-old Wasiu (surname inknown) were known to share some things in common. Despite the difference in their ages, both worked as motorboys within Trans Amusement park premises in Ibadan where they helped in loading goods into trucks. Not only that, they also lived in the same house at Sango area. However, they were rudely separated in a manner that has continued to evoke tears in Musa, not only because he had been arrested by the police for allegedly causing Wasiu’s death, but because what he thought was a minor disagreement led to Wasiu’s death in an unexpected way. The incident that landed Musa in detention occurred on Sunday June 17. According to information gathered, the truck which they were attached to as motorboys had a minor fault that Musa felt he could work on. As he was effecting a repair on the faulty truck, he needed a screw driver and he asked Wasiu to help him bring one from a tool box. Wasiu reportedly did Musa’s bidding but the screw driver he brought had a skewed end, so, it could not serve the purpose it was intended for. Musa then told Wasiu to bring another one and that was the request that got Wasiu angry. He reportedly shouted at Musa to stop sending him on errand, asking him to get up and go and do it himself. He was also said to have rained vituperations on Musa. Musa then reportedly replied that what he was doing was for the benefit of both of them as the truck was their source of income. An argument ensued and in the process, Wasiu allegedly slapped Musa. Infuriated by what he felt was an undeserved assault as the slap landed on his cheek, Musa was reported to have given Wasiu a hard shove, an action which led to the latter’s eventual death. Unknown to the duo, a live wire had fallen from a pole on an iron sheet beside where they were arguing and as Musa gave Wasiu a push, the latter lost his balance, hit his back against the iron sheet and immediately got electrocuted. After letting out an agonising cry, Wasiu got stuck to the iron sheet and could not move. People who rushed to the scene when they heard his cry became afraid when they saw him. Nobody could move near him for fear of being electrocuted also. A police source who spoke with Crime Features said the wire was eventually disconnected from the pole. Wasiu’s body reportedly fell to the ground with a thud, with blood gushing out of his mouth. He was said to have died right there but sympathisers still rushed him to an undisclosed hospital where he was confirmed dead. The police source added that his corpse was thereafter deposited in the morgue of Adeoyo Hospital but was released to the family for burial after an autopsy was conducted. Weeping when speaking with Crime Features, Musa said he never intended death for Wasiu, revealing that he was still in a state of shock over the death. “We were living in the same house at Sango area, his parents know me, and we were working together. I didn’t know there was a live wire nearby. 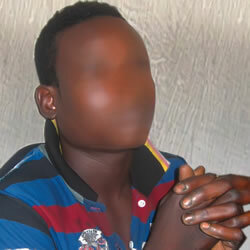 I just wantyed to get him off me when he gave me a slap,” Musa added. However, the Police Public Relations Officer,”DSP Olabisi Ilobanafor, while speaking on the incident, told Crime Features that “the case is a direct one and is currently being investigated at the State Criminal Investigation Department (SCID), Iyaganku.